These sites served various purposes and are important by virtue of their historic, architectural, traditional, artistic, aesthetic, scientific or archaeological value. 1 King Street - formerly the Manse of the Burchell Baptist Church. 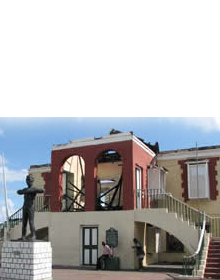 Admiralty Houses - part of the Old Naval Dockyard in Port Royal. Bamboo Avenue - is located on the main South Coast Highway, in the parish of St Elizabeth. Barnett Street Police Station - dates back to the late 19th century, constructed of cut stone. Bob Marley Museum - is located along Hope Road in the former residence of the Hon. Robert Nesta Marley. Bog Walk Gorge - or Rio Cobre Gorge was discovered by Carey Helyar during the 1660s. Cast Iron Fountain - located near to the Courthouse in Savanna-La-Mar, Westmoreland. Claude McKay's Birthplace - internationally acclaimed writer and poet, born 1889 in James Hill, Clarendon. Colbeck Castle - is a massive stone and brick ruin with walls standing to their full original height. Craighton House - was named after its first owner, George Craighton. DeMontevin lodge - built in 1881, is an eclectic mix of the Victorian architectural style, with gingerbread details. Devon House - is a fine example of nineteenth (19th) century domestic architecture in Jamaica. Edinburgh Castle -was built by Lewis Hutchinson, who is Jamaica's earliest recorded serial killer. Falmouth Wharves - stand as a reminder of the town’s former glory. Firefly House - home of British Playwright Noel Coward, called "Look Out" by the famous pirate Henry Morgan. Golmont View House - originally consisted of a 10 bedrooms including a dungeon used in the days of slavery. Gordon House - became the official meeting place of the Jamaican Government on Wed, October 26, 1960. 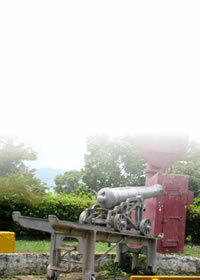 Grove Hill House - located in Montego Bay, the capital of St. James, was built in the early 18th century. Harmony Hall House - is indicative of Jamaican-Georgian architectural style with its intricate fretwork. Hibbert House /Headquarters House - head office of the Jamaica National Heritage Trust, 79 Duke St, Kgn. 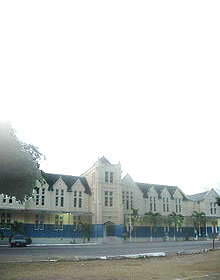 Institute of Jamaica - was established in 1879 during the governorship of Sir Anthony Musgrave. Invercauld - on Black River’s seaside High Street is a fine example of late Jamaican Georgian architecture. Kendal Railway Tragedy - The worst railway disaster in Jamaica’s history on September 1, 1957 at 11:30. Lillian’s Restaurant & the Ruins of Three Concrete Silos - built around 1912, stands as a charming bungalow. Lovers' Leap - consists of a cliff with a drop of approximately 1,600 feet. Manchester Club Golf Course - built in 1865 & possibly the oldest surviving club in the western hemisphere. Moneague Inn - In 1860, described as “the best hotel in the island”. New Castle Training Depot - founded in 1841 by Major Gen. Sir William Maynard Gomm (later Field Marshall). Oakton House - erected around mid 19th century, displaying features informed by Georgian architecture. Old Police Station and Court House - location was originally the site of a Jewish Synagogue. Old Slave Ring - at the corner of Union & East Streets, is a semi-circular arena-like structure with brick walls. Orange Park - located in the hills of Yallahs, St. Thomas, was once a coffee plantation. Persian Water Wheel - ordered by the Falmouth Water Company and installed in 1798. Public Building East & West - among the early structures in Kingston to utilise concrete in its construction. Rio Bueno - small town believed to be where Christopher Columbus first landed. Stewart Castle - offers valuable insights into the dietary habits of the Tainos. The Dome - is located in St. James, erected over the source of the creek in Montego Bay. Town House - built in 1776, this building predates the Parish Church by ten (10) years. Ward Theatre - presented as a gift to the city of Kingston in 1912 by Colonel Charles Ward. White Marl Taino Midden and Museum - established in 1965 in memory of Dr. Randolph Howard.